The main fountain consists of two different waterscapes: an extensive sheet of water and a large walkable fountain of 135 LI-F5200 compact jets from Lumiartecnia. Each LI-F5200 walkable compact jet contains: a multi-color LED RGB ring projector; a progressive valve RS-LI-1245, which does not produce a water hammer, and which has a variable shuting speed between 0.1 s and several seconds (depending on the system’s programming); and a flush and adjustable nozzle capable of producing a vertical spout with a crystalline aspect that can reach heights greater than 10 m.
All these elements are integrated in a stainless steel filter cover – able to support the weight of a car that passes over – that is screwed to a stainless steel niche, which in turn connects the supply and drain pipes to recirculate continuously the water from the fountain. In this way, the water quickly returns to the compensation tank, where it is purified and filtered with the quality and hygiene of a pool system, controlling the PH and the precise doses of chlorination so that the water from the fountain flows always clean and crystal clear and so the children can play with the walkable jets with total tranquility and security. The sheet of water overflows from the upper perimeter, wetting the entire granite stone surface of the fountain, creating a large pond covered by a thin layer of water of just 2 cm, through which visitors can walk and refresh their feet in the hot days. The water in this film is never stagnant, as it flows continuously, generating at the same time a relaxing rumor similar to that of a stream, which not only refreshes the feet, but also the environment. The fountain and the sheet of water work combined by the use of the Controlidor computer system in different ways: water sheet only, sequential, interactive and show. In the sequential and interactive modes, people can interact with the 135 walkable fountain jets, which will have programs with different slow or dynamic sequences or a combination of both. The Show mode is meant to be a Great Luminous Aquatic Ballet. In this mode the jets will reach a great height of more than 8 m, making very dynamic and aesthetic sequences, visible from all the ample space that surrounds the main fountain. The E2 Fountain is located in the park access plaza from the northeast. Channel E2 goes down from Fountain E2 to the west bordering the projected path between the ships and the garden garden. To achieve the continuity of the canal that ends in front of the Alquería, a reflecting water mirror that works independently from the first circuit is created on the other side of the bridge. The water in this pond is fed under the same bridge which flows into the return canal of the pond, covered with black granite, which is located under a marble bench in front of the farmhouse. Fountain E3 is located at the entrance to the park on the east. The E3 canal is projected from the E3 fountain by the center of the development between the vegetables garden and the children’s garden. The water is channeled through the middle of the canal to create areas with less current where aquatic plants can develop. The vegetation is arranged in a staggered form from these edges towards the center of the canal through garden boxes built in bricks. Finally, the water falls into a glass through a 40 cm high waterfall. Its edges are white marble and its bottom in black granite. The water is collected below the edge facing the waterfall which has the function of being a bench where people can sit. Fountain E4 is located at the access to the park through the South access. The canal E4 is projected from the Fountain E4 by the south of the performance together with the children’s garden and ends next to the courtyard of the farmhouse building. This fountain and its canal integrate an interactive walkable fountain for children’s recreation composed of 20 compact walk-in jets, model LI-F5200 of Lumiartecnia. The water in the waterfall creates a sheet of water that runs down the slope of the plane towards the eastern edge of the fountain where the water return channel is located. The 20 LI-F5200 walkable compact jets, which integrate multicolored LED lighting, work independently through a different circuit and are programmed through Controlidor software to create varied sequences with different heights in the fountain jets that are safe to play with small children. The water from these fountains is also collected on the east side of the fountain. Adjacent to the fountain is canal E4, which is lower than the water level. The general effect that is achieved between the fountain and the canal is to create a continuum of water moving from the upper pond through the sheet of water and the water jets that are then emptied into the channel. To make the canal flows up to the end in front of the Alquería, a channel is created that works independently of the rest, but maintains the continuity of the canal. 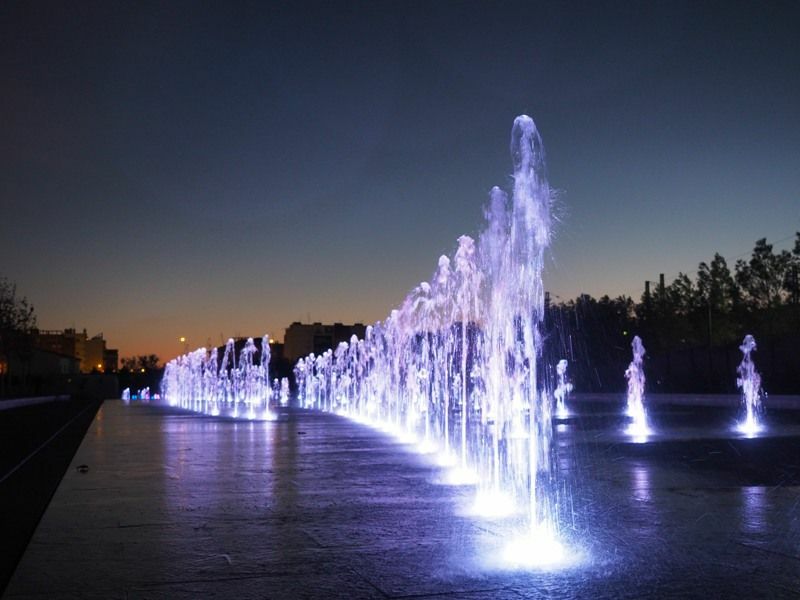 The engineering and the technology of the set of walkable fountains, waterfalls and water canals of the Parque Central (central park), has been carried out by Lumiartecnia Internacional in collaboration with Imesapi. The LI-F5200 Wlakable Compact Jets and Controlidor software are patented by Lumiartecnia Internacional.